Player can be used in iOS devices apps. For such cases WkWebView component is used with HTML5 bradmax player inside. For simplifying integration process with iOS app Bradmax library was prepared (lipo/fat lib *.a file with required header files *.h). Minimal version for use Bradmax library on iOS devices: iOS 8.0 Bradmax SDK is using WkWebView, which is supported on iOS 8+. Click link below for downloading library in ZIP file. 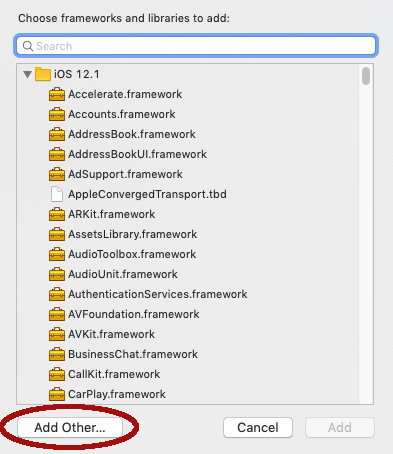 2.1 Click on name of your project in left panel of xcode. 2.2 Click on your main target in TARGETS section (middle of screen - on screen element with name “BradmaxPlayerDemo”). 2.3 Click on tab "Build Settings". 3. Add BradmaxPlayerSdk/BradmaxPlayerSdk.a library file into your project build. 3.1 Click on name of your project in left panel of xcode. 3.2 Click on your main target in TARGETS section (middle of screen - on screen element with name “BradmaxPlayerDemo”). 3.3 Click on tab "Build Phases". 3.4 Expand “Link Binary With Libraries” section. 3.5 Click on “+” button in left bottom corner of “Link Binary With Libraries” section. 3.6 In new popup click “Add Other…” button. 3.7 Select file “BradmaxPlayerSdk.a” in new popup window and click "Ok". Below is link to sample Xcode project with single view iOS app with bradmax player. Project has already configured Bradmax SDK library.